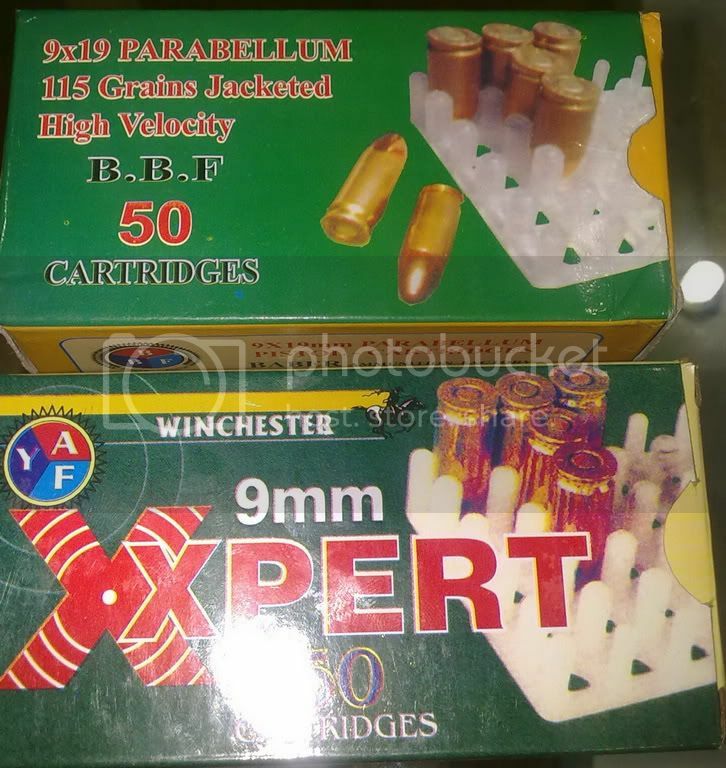 Let me start of this thread with a comparison I did today for the commonly available Chinese and Russian ammo in the markets these days. This little review is testing for FTF/FTE issues more than anything else. 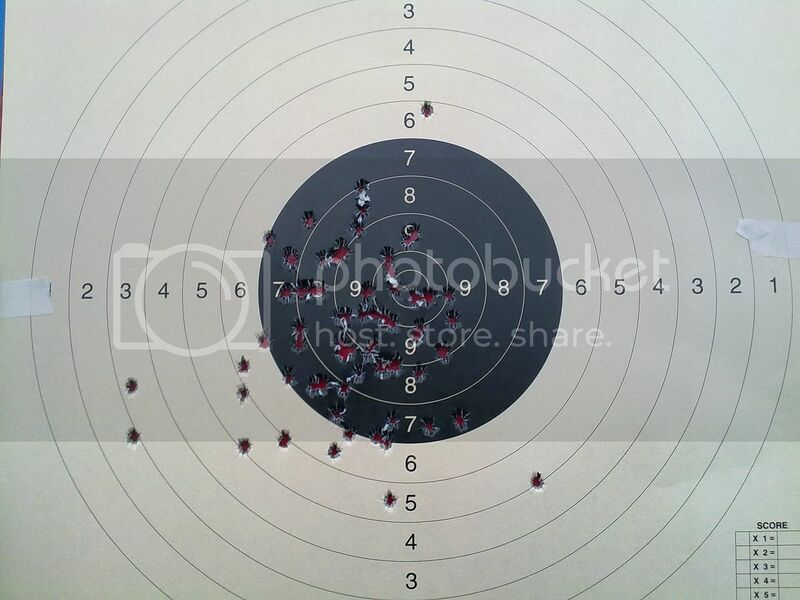 High accuracy was a secondary concern as I did not have the time for a bench rest nor do I consider myself a good enough shooter to have consistent small groups required for ammo testing. 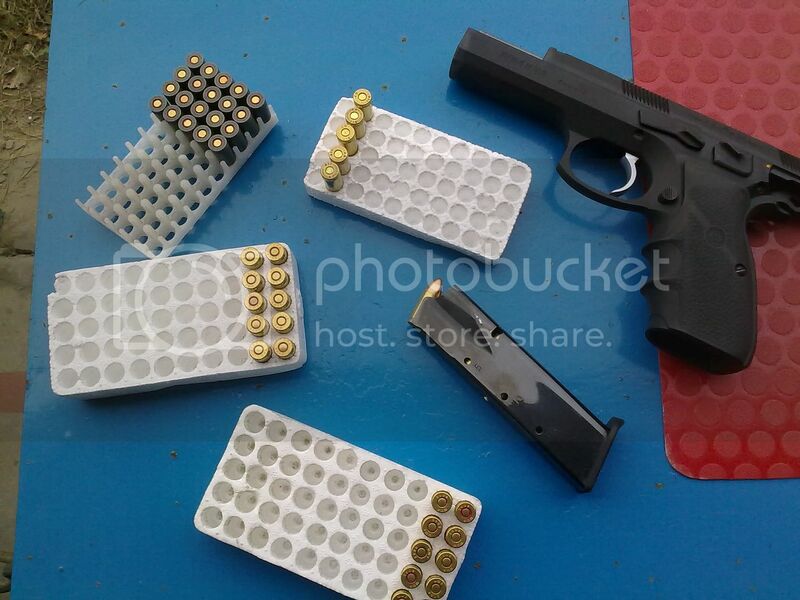 The ammo tested today was all 9mm, four popular/common brands were tested. 1). Chinese RED Box made by China North Industries Corp. Load "Not Given", Marked "311" and "07". 2). Russian White Box made by TULA Cartridge Works or "TCW". 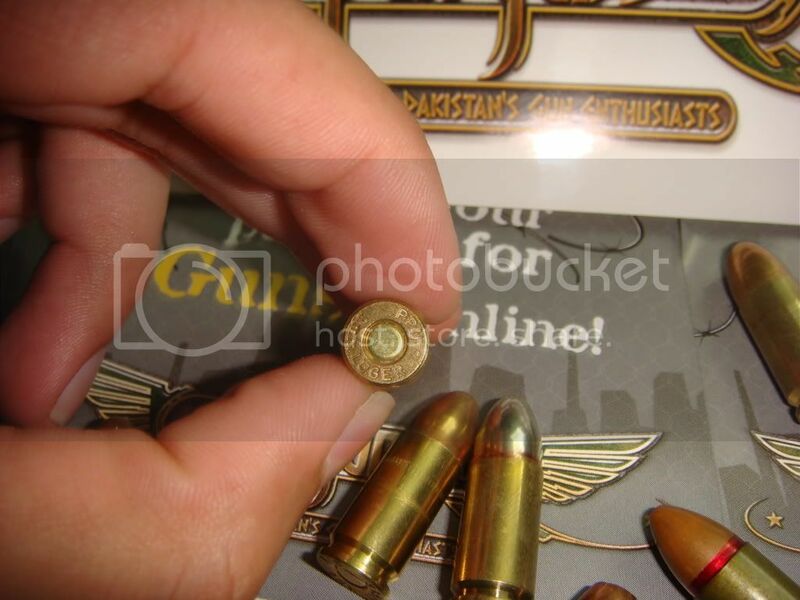 Load "115 Grain", Marked "WOLF"
3). Chinese White Box made by Poly Technologies Inc. Load "Not Given", Marked "9mm" and "2008"
4). Chinese Blue Box made by "Not Given". 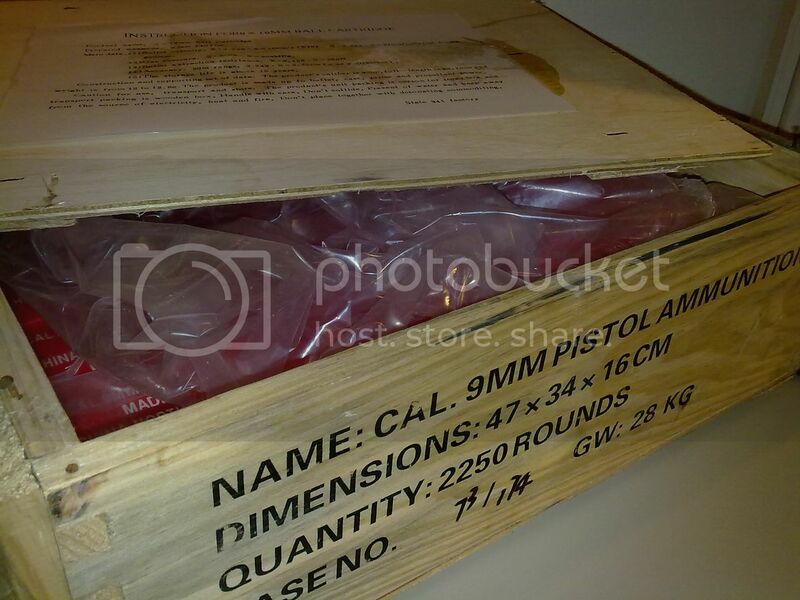 Load "Note Given", Marked "9mm" and "2008"
Fired at the speed of 1 round per 2 secs. I'm happy to report that although I tried a few things like limp wrist, loose grip and rapid fire to cause FTE's or FTF's there were none. I was also expecting that after firing 200 rounds the pistol would become messy enough to have issues itself. 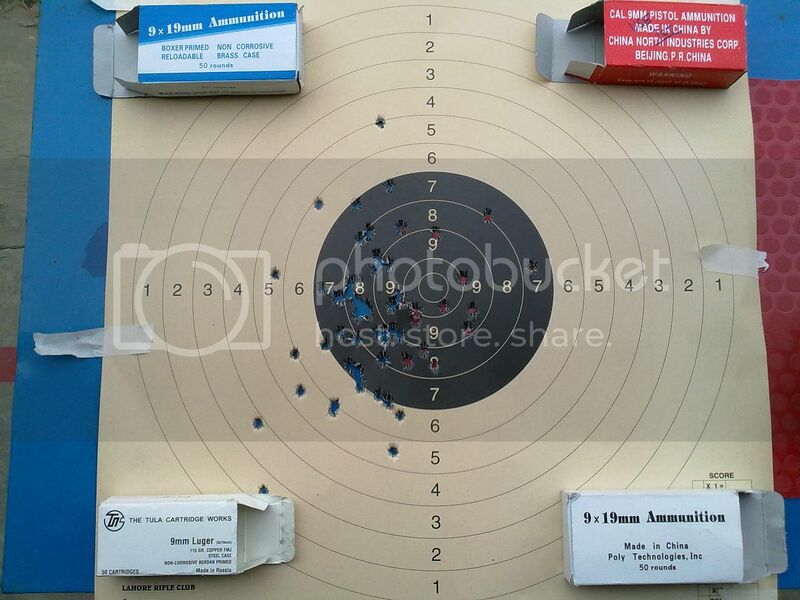 There were none, the whole session of 250 rounds + went smooth. I liked the Russian ammo the most, followed by the PolyTech. It made for good accurate firing with a medium kick. Red box ammo seemed more like a +p load and there was also more smoke after firing each shot. The Poly Tech and the Blue Box Chinese are pretty much the same ammo only with different boxes. Given a choice in this price range (Rs. 28-35) I would take Wolf over anything else. 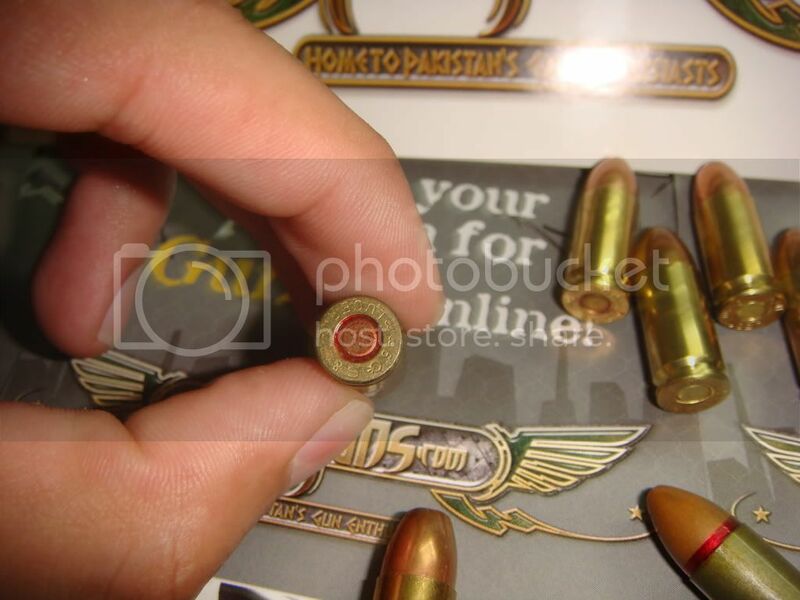 Bought from Karachi at the Price of Rs. 30 per. Comes in a case of 2250. Pasted on the inside of the carton. 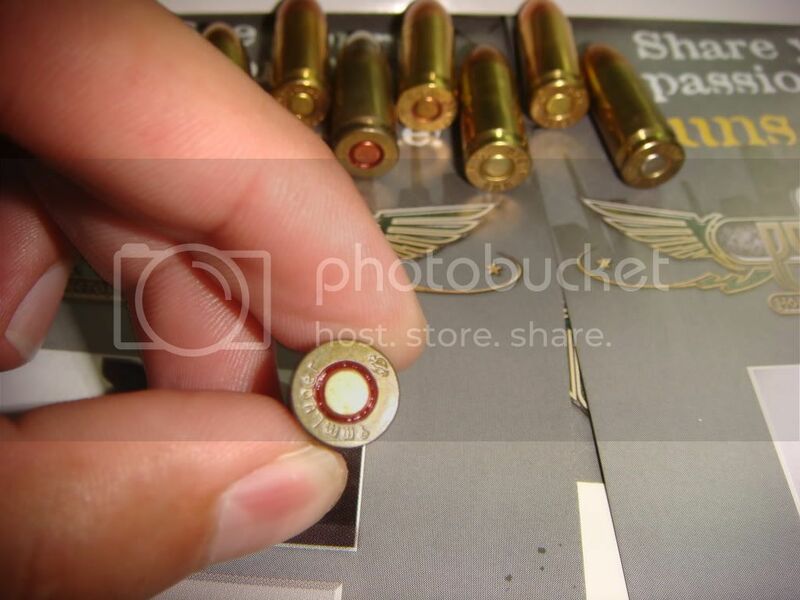 Will provide all the info you need to know about red box ammo. @ Abbas, Excellent shooting, and it will be informative if you can also include the distance and indoor/outdoor. The Worst Weakness of Human Being is \"Fear to Loose\", won\'t let One Try and won\'t let One Grow. BRAVE is Not the One Who Don’t Fear but the One Who Fear and Still Try. 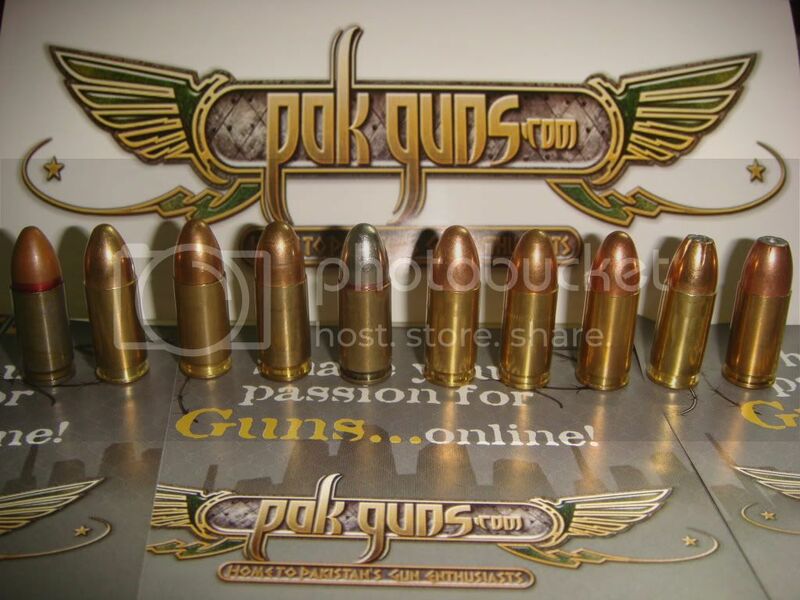 Very informative detailed review Abbas thanks for taking time for test & write up. 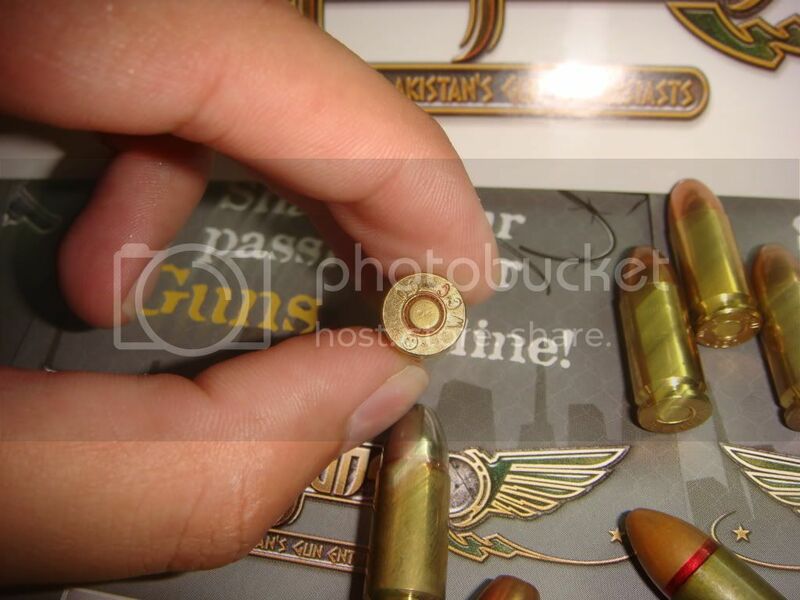 Since re-filled POF or Chinese ammo is also been reported on the shelves these days, can you please (or any other member) do a comparative report/review with pictures & tips to check the ammo before making a purchase? most of the shopkeepers try to sell a conterfeit as original and in small places like Sialkot even shpkeepers dont know what exactly they are selling, so we must know what a conterfeit looks like for the safetly of our own self & the firearm. @A.Abbas and Denovo87. Thanks, the distance was 10m and 15m. 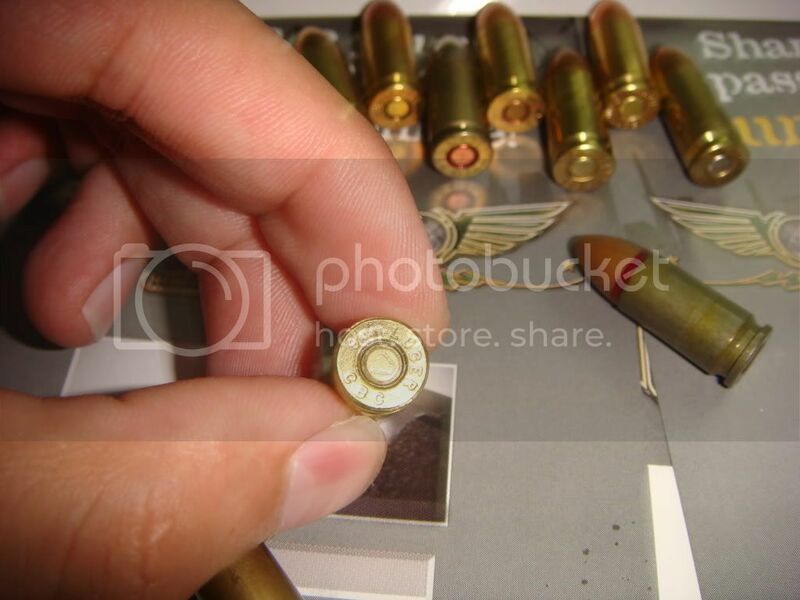 InshAllah in this thread I'll try to add many types of ammo. 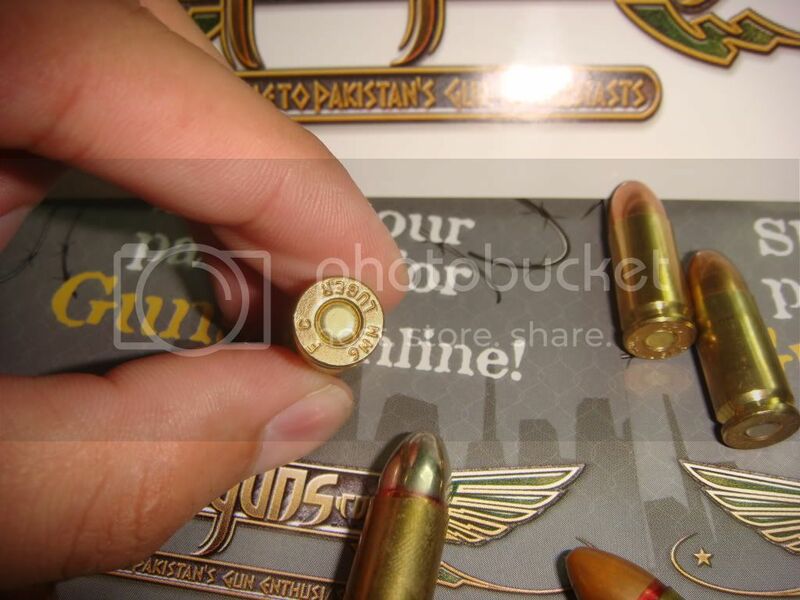 I suggest everyone share their experiences to make this thread as comprehensive a guide to ammunition available in Pakistan as possible. 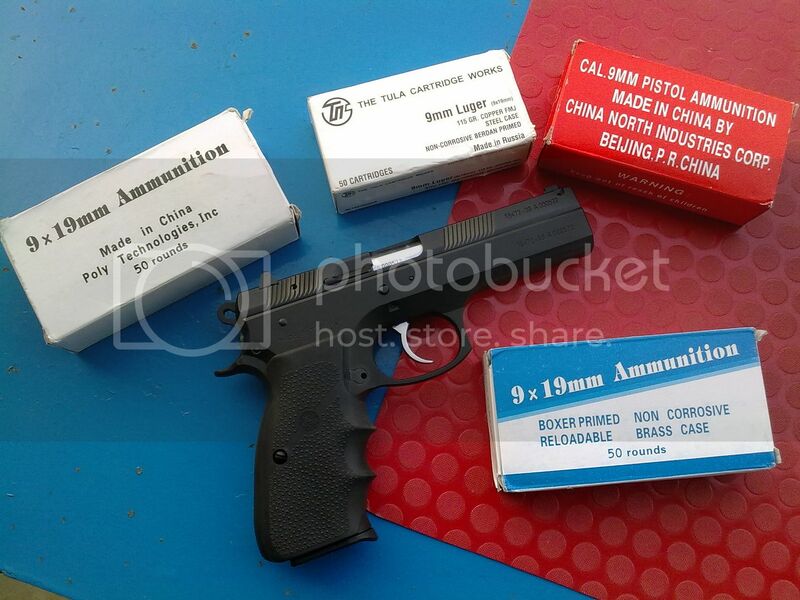 Almost forgot, here are the cheap copies of POF 9mm. Btw there are better copies out there as well, I don't have any right now, if anyone has a couple in hand please post. I have rated Winchester 9mm as the best then ,russian tula 9mm ,third i found sellor bellot and then pof 9mm in all of these 8. 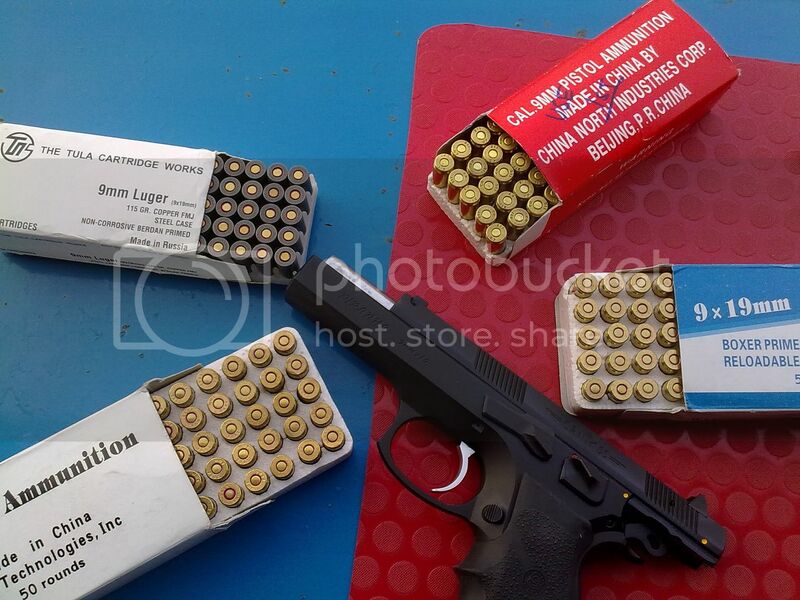 Great pictures Taurus, good varitey of 9mm's you got there. 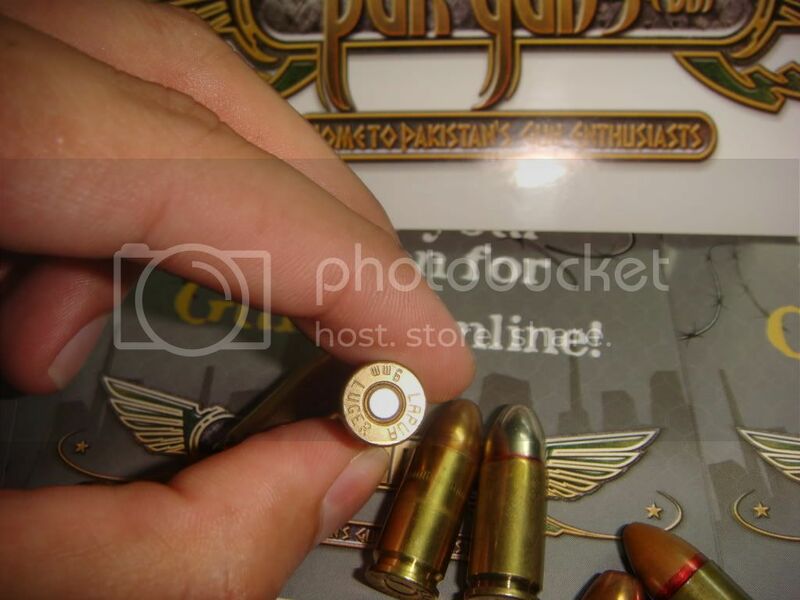 I have not come across Winchester 9mm's here in Lahore. 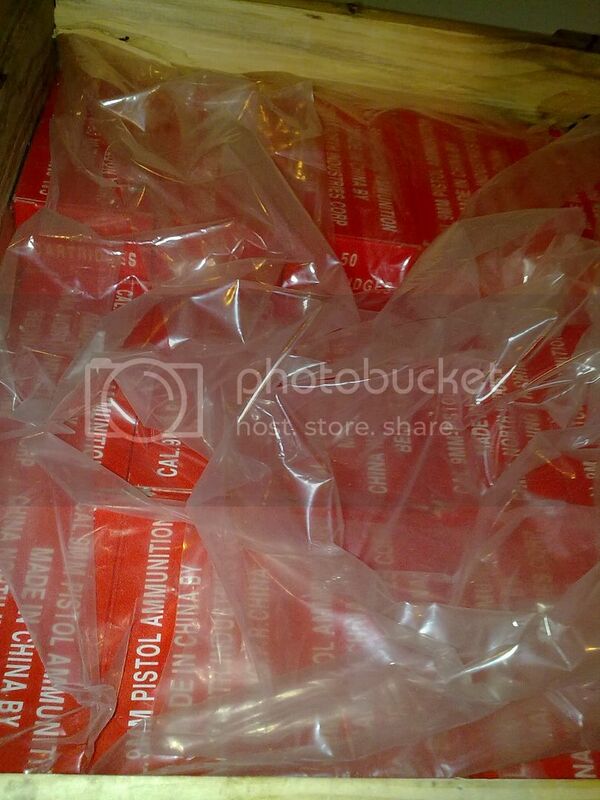 How much do they cost and what does the packing look like ? Btw I did a test of almost all the Russian rounds availble in the market the other day but forgot to take pictures. 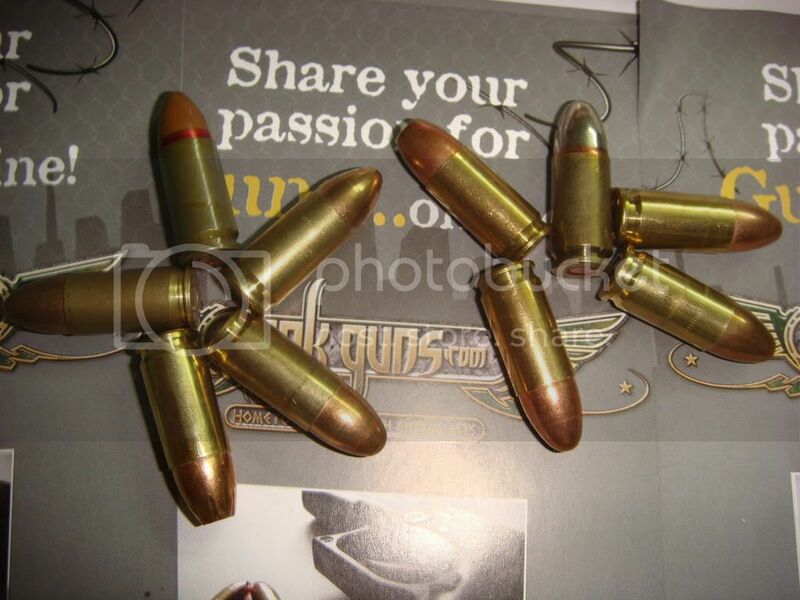 I think Slayer, Starfish or Anthrax should have all 5 variety of Russian rounds lying around. If any of you do, please post pictures. The best undoubtedly are Tula made Russian marked "Wolf". @Taurus... A very nice post with some great close ups :) BTW which camera did you use? @Taurus............Excellent collection bro, beautifully portrayed. I like your box of 100's in transparent color. I got a similar one but in green. Where did you find this plz? @Abbas/Ilyas...........I found these by Winchester a few months back in Peshawar. 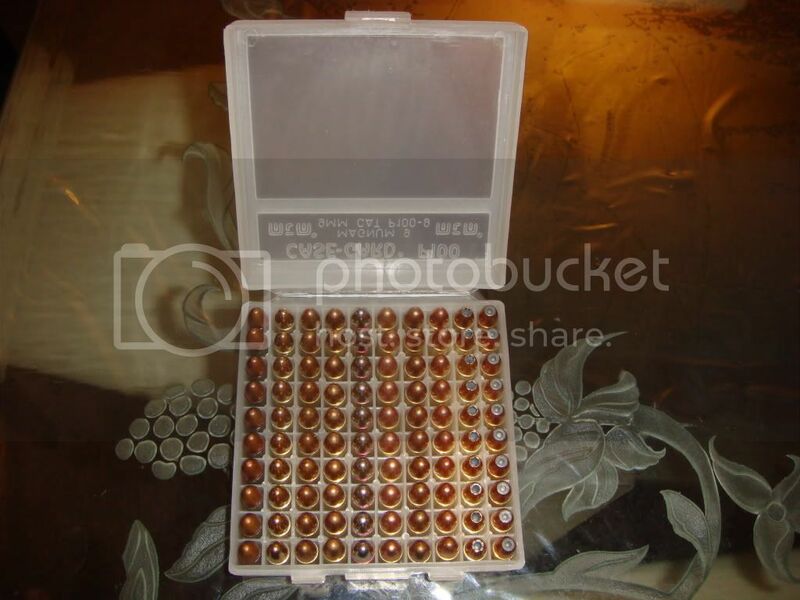 Packing was simple "beige" carton, rounds really looked good, price quoted was 85/per round. 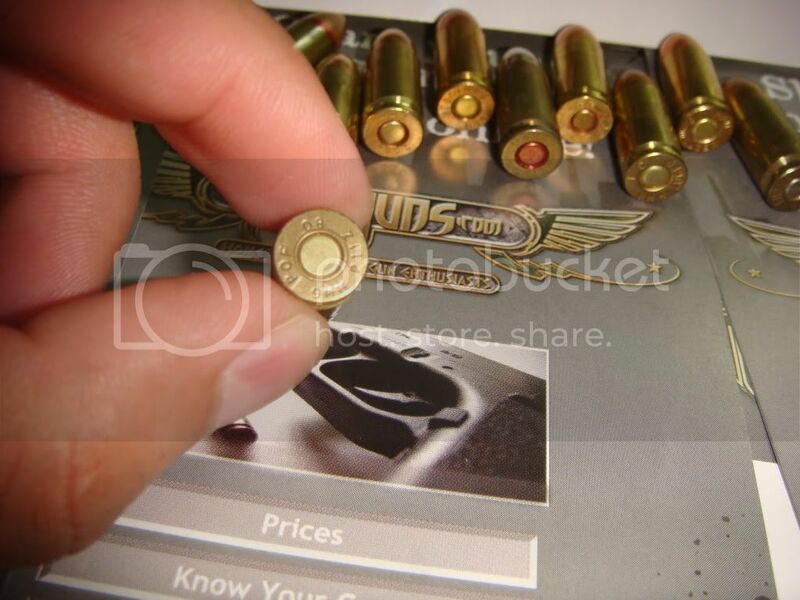 DEAR THANX FOR SHARING RATE, BUT WHERE IS THE PRICE OF hollow point 9mm. 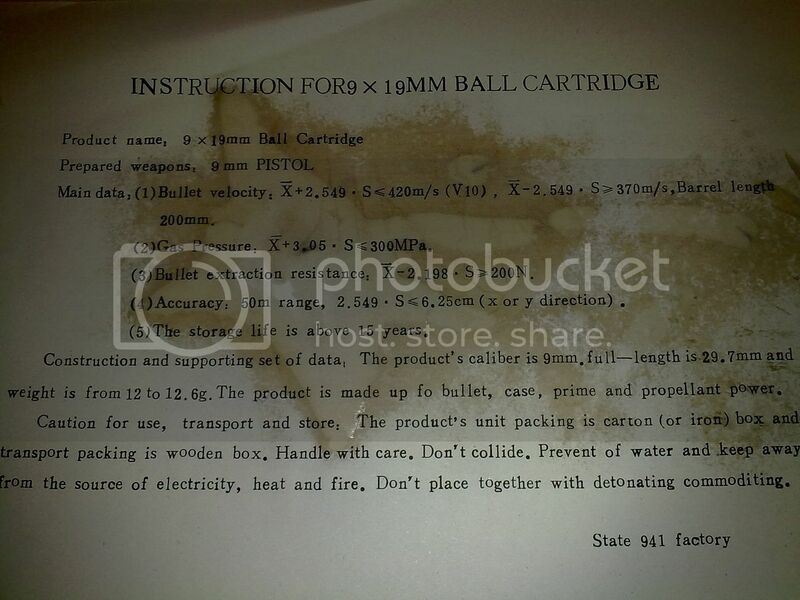 kindly letus know the price of 9mm hollow point as soon as you could. 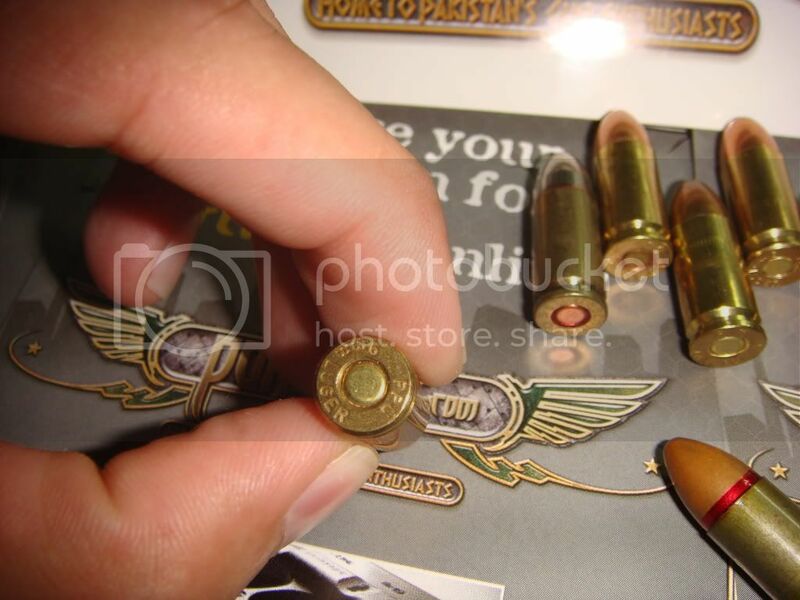 I have reloading press and dyes but I do not know if I can bring it to Pakistan and whether the powder, casing and primers will be available in our country? What is your response? 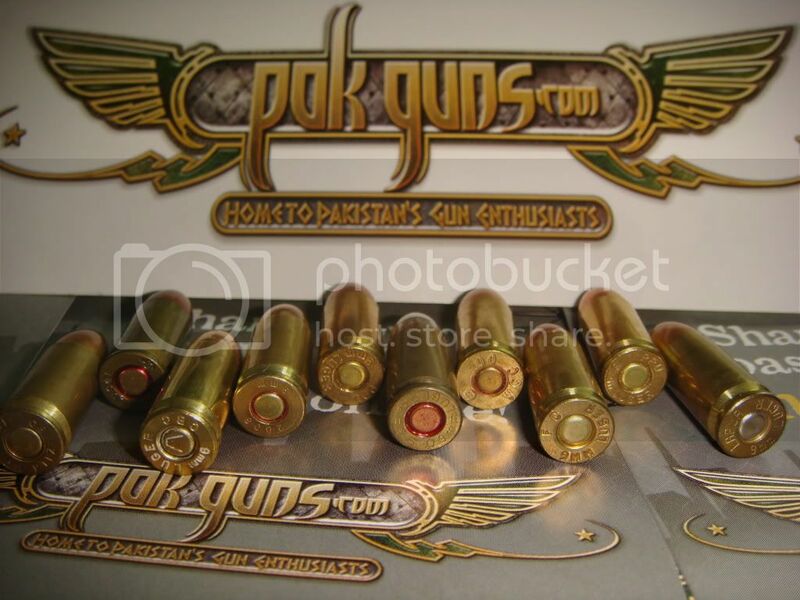 \"GUNS only can’t assure you a victory until seized by the brave hearts\"
Sir i suggest you contact sir Skeeter60, maybe through Abbas bhaee or other Lahore members. 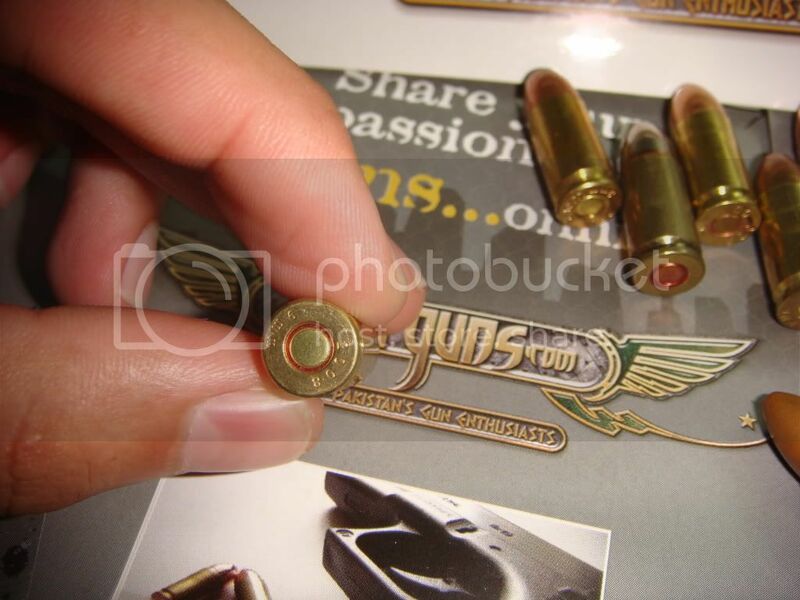 I think he'll be able to guide you in this regard, because, if I'm not wrong, he himself is into reloading. Thanks for your rsponse. You mean it is not practical. So, I do n't need further information. I trust your opinion. it is sad and disapionting that we have the resources and the skills, yet we are not free to use it. we are sincere and law abiding organization, yet we are restrainted and those who are professional crimnals .........................they get what they want! It is sad ...sad....story.